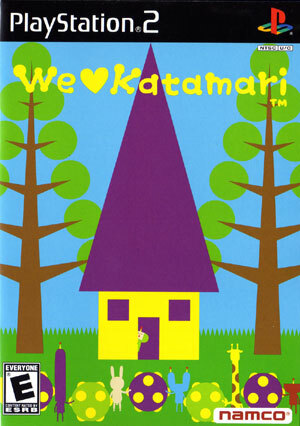 We just bought ‘We heart Katamari,’ the sequel to ‘Katamari Damacy,’ and it really is a very beautiful and fun game (above is the game box illustration). I am so in love with the visuals of this game that I thought I would write a short review/description of the game and game world. 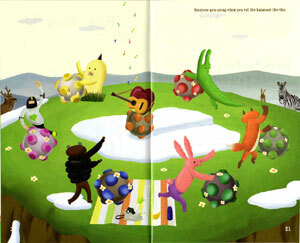 The world of Katamari has a playful aesthetic and is populated by colourful and quirky characters. The premise behind the game is that your father, the King of the Cosmos, accidentally destroyed the stars of the Cosmos and so he tasks you, his prince, to roll up objects on earth on a sticky Katamari. 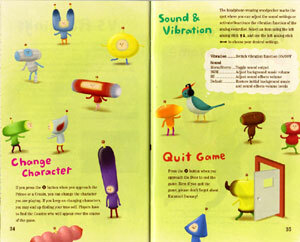 Everything can potentially ‘stick’ to the Katamari, although only similar sized objects, relative to your Katamari’s size, will actually ‘stick.’ During the game your Katamari will roll up pins, ants, buttons, batteries, butterflies, slugs, frogs, magnets, candy, fruit, plants, school children, your princely cousins, sofas, etc. The king tasks you with creating Katamaris of a specific size within a given time limit. If you successfully roll up enough objects within the time limit, the King throws the katamari out into the Cosmos to become new planets and/or stars. The game is delightfully simple but very engaging and clever. And loads of fun! It even has a two player co-op mode whereby you can partner up with a friend (or your loved one :) and each player controls the Katamari. Similar to the game play, the world of katamari is simple, vibrant, bold and enchanting. The whole game, from the interface, to the characters, to the animations are all very beautiful and all these elements create a rich world and gameplay experience like no other game (in my opinion). The audio is also full of catchy little tunes that are simple yet exotic. I highly recommend this game if you like quirky/alternative games and I even think its worth renting just to see and hear its unique game world. The following images are from the game book which is full of brilliant art work. I want this game soooooo badly!! Lindsey — hello! Say hello to Master T and Mr D. I hope you guys are well. I want to play this game after seeing the dancing fox in the game book. This game is so wild. Fivedog and I may heart Katamari too. Lindsey has since convinced me to get a PS2 to quench her Katamari desire.